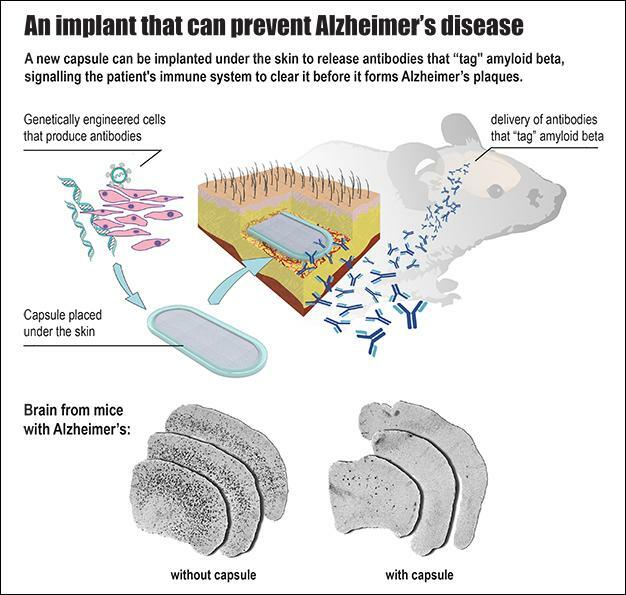 IMAGE: This is an infographic of how the implanted capsule releases antibodies to the brain. The capsule itself is based on a design from Aebischer’s lab published in 2014. It is referred to as a “macroencapsulation device” and it is made of two permeable membranes sealed together with a polypropylene frame. The completed device is 27-mm long, 12-mm wide and 1.2-mm thick, and contains a hydrogel that facilitates cell growth. All the materials used are biocompatible, and the lab specifically used a method that is easily reproducible for large-scale manufacturing.